The new C-Conveyor is explosion-proof, so no costly investments in ATEX protection are required. Low energy consumption is a further benefit. Poeth’s new C-Conveyor is explosion-proof, so no costly investments in ATEX protection are required. Vertical conveying and reintroducing raw materials into the process is a regular requirement in production processes for powders, pellets and granules. Thoroughly emptying conveying systems is extremely important and one of the main conditions for an efficient and contaminant-free production process. However, effectively emptying traditional bucket elevator systems, particularly when conveying lightweight, fine powders, is more easily said than done. Buckets attached to a belt or chain scoop dry raw materials from base of the elevator (feed point). At the discharge station, the product is thrown out of the buckets, powerfully but at low speed, under the influence of centrifugal force. Residues of the raw material are often left behind, particularly in the case of lightweight materials. The result is a loss of capacity and cross-contamination in the elevator base. When handling potentially explosive raw materials, the minimum conveying speed is the bottleneck for bucket conveyors. Capital-intensive investments in ATEX protection are required as a result. The new C-Conveyor from Poeth has been specifically designed for efficiently recirculating light powders and explosion-prone raw materials. The C-Conveyor transports the raw materials horizontally first, and then vertically before reintroducing them to the process horizontally. 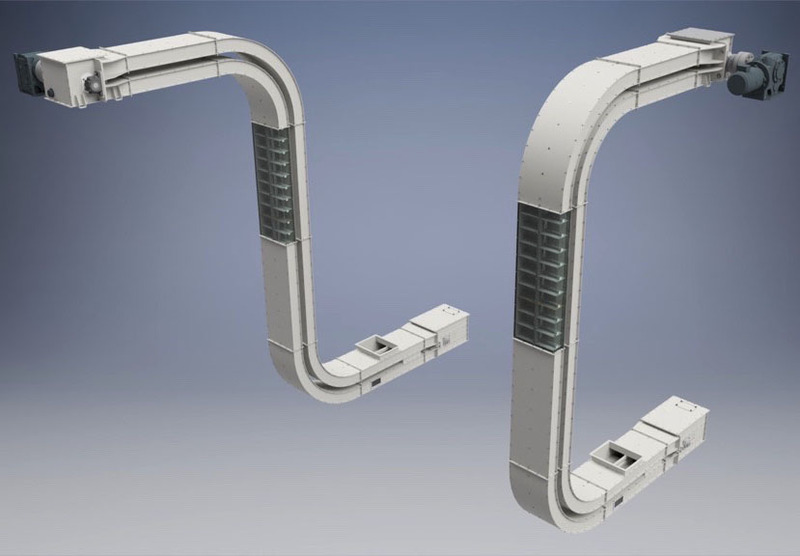 The highly innovative C-Conveyor features plastic paddles which move through a closed channel on a chain and gently “drop” out of the conveying system at the release point. The design makes the C-Conveyor ideal for products that resist emptying. Because the paddles seal hermetically to the conveying channel and base, product residue and product drop-back are minimised. This makes the C-Conveyor suitable for residue-free emptying of conveying systems without risking cross-contamination. The C-Conveyor can run perfectly at speeds of < 1 m/s. So the C-Conveyor is capable of conveying explosive raw materials safely and cost-efficiently without the need for costly investments in ATEX protection. Poeth has invested in an-house C-Conveyor test unit with a height of 9 metres. This unit is used to replicate practical situations, perform long-term “closed loop” testing and subject customer products to trials in a production environment. This offers assurance beforehand and an opportunity to refine the results. Thanks to smart design, the C-Conveyor from Poeth combines an extensive capacity range (5 to 220 m3 per hour) with low energy consumption.